I've always been a big fan of the color samples in the house paint section of Home Depot. Those unassuming sheets of paper, festooned with color gradients, introduced me to a world that was more than simple black and white — a world with 50 shades of grey, several dozen oranges and more green than anyone could possibly ever need. They also prepared me for Blendoku. Blendoku, created by Yeong-Hao Han and ex-Bioware guy Rod Green (green! 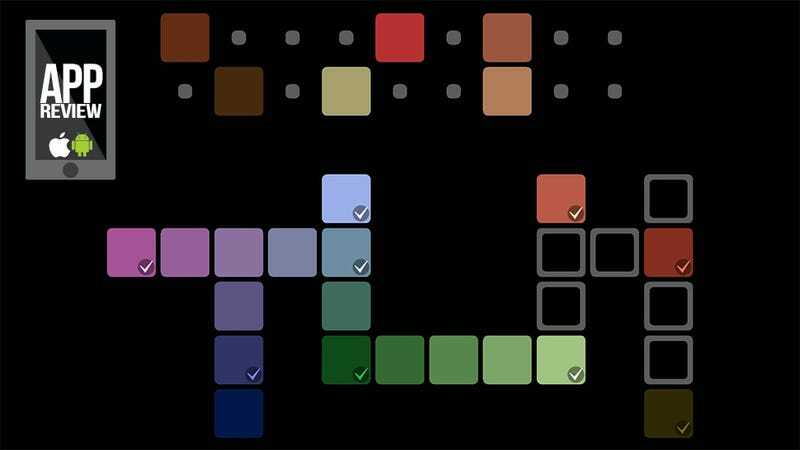 ), is a game about exploring the subtleties of color blending. Inspired by color exercises he performed in art school (been there, done that, made some really horrible t-shirts), Han figured filling in the steps between red and green might be an entertaining way to pass the time. He was right. Players are presented with a playfield with several key colors already in place. Above the playfield are a selection of colored squares. Their task is to place those colored squares in the correct blending order. It's like a crossword puzzle, only with colors instead of letters. The presentation is plain and simple, with no music or fancy backgrounds to distract players from the task at hand. They are here to play with color, and play with color they shall. They'll start small, placing five shades of green all in a row. Soon the layouts get more complicated, with more colors and branching paths. Determining how the colors flow is a learning process, and there is plenty of learning to do here. Blendoku is such a unique and addictive experience that I feel a little bad for Yeong-Hao Han for giving the game away for free. He's included 475 levels (150 simple and medium, 100 hard and 75 master) in the game, all of which can be played at absolutely no cost. There are ads, but they can be removed for $.99, which also grants players five puzzle hints a day. I'd suggest spending the dollar even if you don't need the hints; Han deserves it for capturing the joy and wonder of looking at paint samples in a game.